The Richard de Bas paper mill in France is well known for its floral papers. Less well known are the latest floral papers from Decorah, Iowa. Petals from violets and dandelions and young fern frond tips were added to the Zerkall & milkweed pulp. 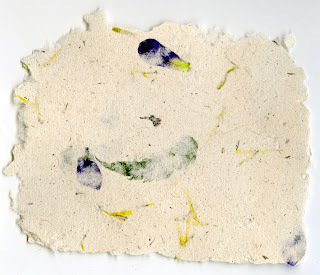 The violet petals were inclined to float to the surface, which made it difficult to incorporate them in the paper. However peristance prevailed and the effort yielded an interesting paper due in part to the contrast between the yellow and purple hues and the different shaped petals and the ferns. This detail shows the tangled web of fibers and a fragment of dandelion petal. 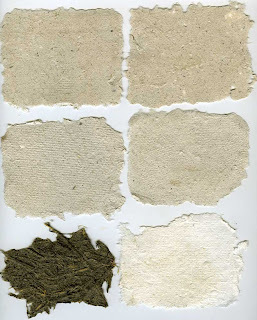 Some new fibers have been gathered: bast fiber from old milkweed stems which will be processed separately; and fiber from some hemp which self-seeds itself on the farm, no doubt a remnant of the wartime crops that were once grown for rope. The milkweed experiments demonstrated that the woody stems, if they were to be of any use, needed mascerating. 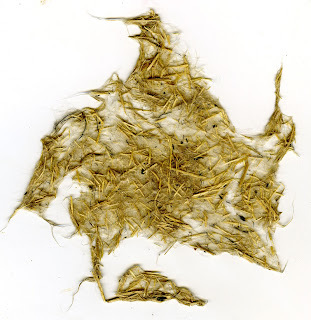 There were plenty of desirable long, bast fibers in the milkweed pulp but they were too long, they needed to be shorter. The solution as exemplified everywhere is to used a Hollander beater or, in this case the kitchen blender. To pulp the woody stems the blender was run for longer than was necessary and chopped the bast fibers too short. In future I will not use the woody stems and devise a less harsh method of pulping (the fibers were first beaten with claw hammers). Nevertheless the milkweed pulp made an attractive paper. All you need is imagination. This is the very first sheet piece of paper I have made from wild plants growing here on the farm in northeast Iowa. In fact it is only the third piece of paper I have ever made in my entire life! But can you see the potential. Inspired Russell Maret's visit here this week and the report of his visit to master paper maker and McArthur Fellow, Timothy Barrett at the University of Iowa, I decided to pursue the idea that all the materials needed to make a book were growing here on the farm. I have been looking for a niche market crop we could grow and wondered if kozo, or Paper Mulberry (Broussonetia papyrifera) might be possible. The common Red Mulberry (Morus rubra) grows here readily and when clearing branches I have noticed the bark is very tough – perhaps it also could be used for paper.